We left Ohrid via the internet café, which luckily wasn’t affected by the powercut that seemed to be blacking out most of the town. The day had dawned sunny, but clouds were rolling in. 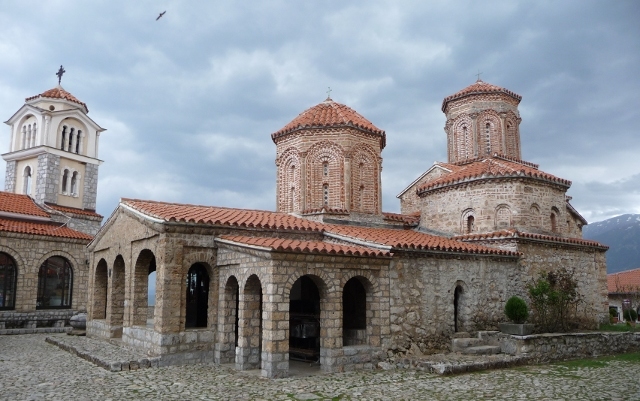 Our first foray was to Sveti (Saint) Naum, a monastery along the south eastern bank of the lake – close to the border crossing with Albania where we’d been turned away a couple of days before. Judging by the amount of souvenir stalls along the pathway to the complex, which is now more hotel than monastery, it’s a very pretty spot that is a tourist magnet in summer. By the time we reached it though, it had started raining. Although it is guarded by a fierce flock of peacocks, the place is tranquil, and the 17th century church we’d come to see was hidden away in a courtyard. It was a really special place, originally founded by Sveti Naum in the 10th century. One of the villagers was ploughing with two oxen one day, when a bear attacked and killed one of them. He sought help from Sveti Naum, and was amazed to see that the bear had been put into the harness and was ploughing alongside the remaining ox. This story is just one of the illustrations shown in the marvellous frescoes in the charming small church, with the inside of its dome typically painted with Christ Pantocrater. As we left the church the guardian passed us glasses of rakia. A welcome warming burst of mellowness on a miserable day. 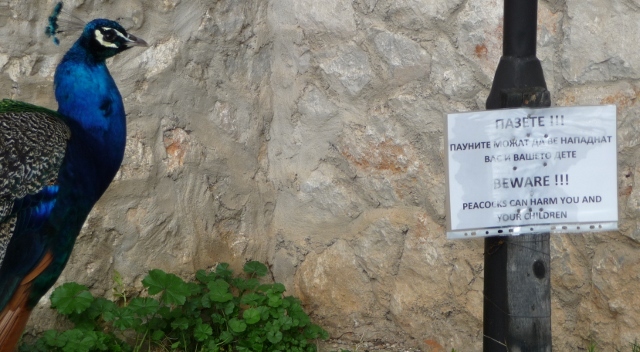 We managed to escape without molestation by the noisy peacocks and drove up into the mountains on the route across to Lake Presper, and part of the Galicica National Park. 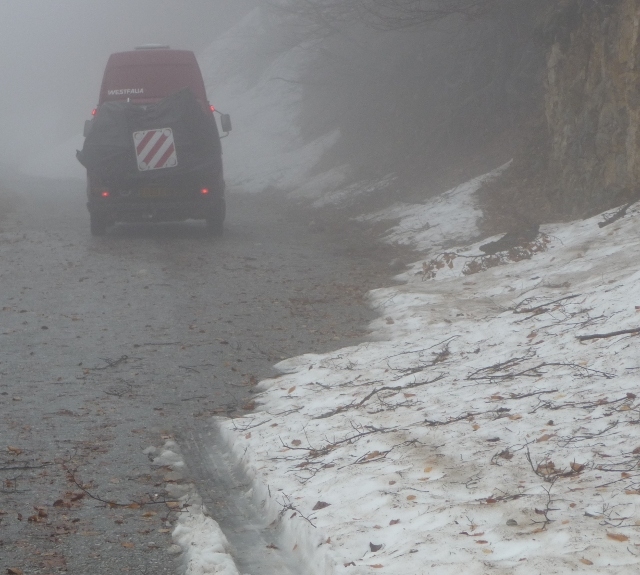 As we ascended, the cloud closed in and although we were still within the treeline, we found snow on the road. We got around the first patch or two, but then there were sizeable remains of a drift right across our path. We’d have had to do some digging and who knew what else lay ahead further up into the clouds. There was just too much for us to risk going through. Reluctantly and very gingerly, we turned the van round. Bear in mind that there was a sheer drop onto the steep wooded slope below. It was a little tense, especially when we skidded on passing the rest of the snow piles and were seconds away from potential calamity. We’d made the right decision to turn back. Our choice then was a longer route, north again up the east bank of the lake via Ohrid town and then further eastwards. By the time we reached the eastern bank of Lake Presper, the weather had changed again, and the lake and its villages were bathed in sunlight. Lake Presper is slightly smaller than Lake Ohrid and is split by three borders – Macedonia, Greece and Albania. One of the first villages we came to was Kurbinovo, which sits back from the lake shore on a foothill of Mount Pellister. 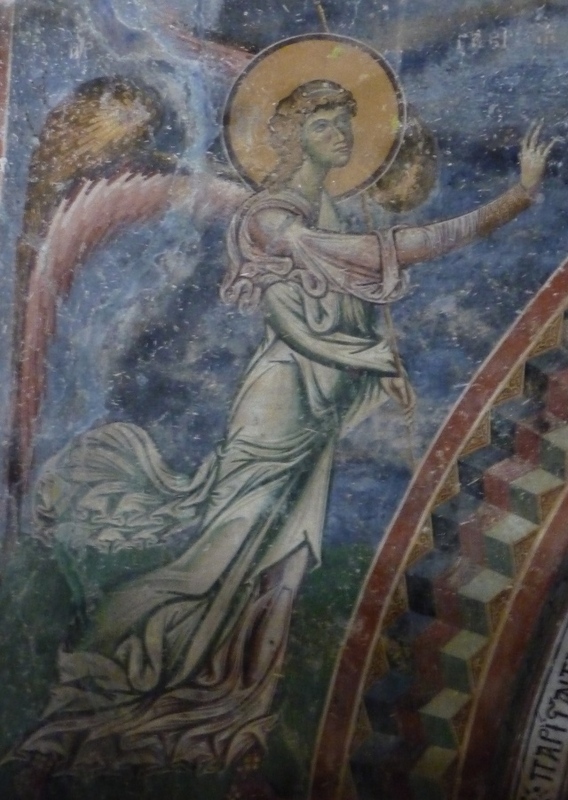 We had read about a church above the village with magnificent frescoes. The village straggles upwards and has a gushing stream through it. This area is prime orchard territory and used to export a lot of its crop to Greece. The border down the road is closed though now. Greece refuses to recognise Macedonia as a country. Alongside a barn by one of the orchards there seemed to be a party in full swing. A couple of chaps were loading up boxes of apples on top of, in and around an old Albanian registered Mercedes sagging at its seams. 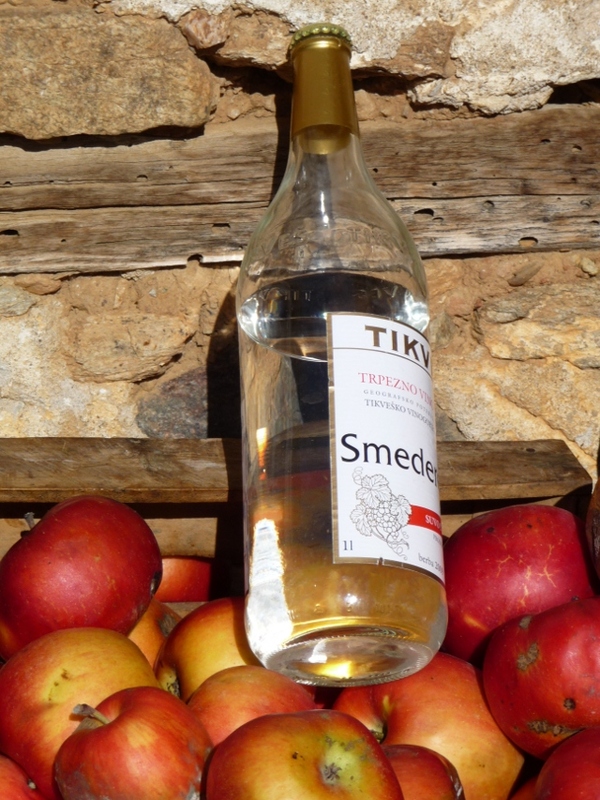 To cement the deal it appeared that quite some rakia had been consumed and they were in high spirits. It was a sight to behold, and they were ecstatic that some Brits in a red camper van, who could speak a few words of Albanian wanted to take pictures of the spectacle! We continued up into the countryside beyond in search of Sveti Gjorgi (St George’s) a kilometre or so further on. We drove about two kilometres, no sign of it. Turned around, but then thought better of it and turned around again determined to find it. Another kilometre or so on and there it was tucked into a rise above the fields – a warm-stoned barn-like building. The setting was magnificent, the silvery shimmer of the lake, snowy mountains beyond it, wooded hills all around and the snowy cap of Mount Pellister behind, and the sound of the rushing water of the nearby stream. What more could you want – the perfect place to spend a night. Of course we should have asked in the village for the key as the church was locked. We trundled back down, past our Albanians, and various waving villagers – and were pointed in the direction of the keyholder. The lady was happy to trust us with the key as long as we brought it back straight away. We asked if she thought it would be ok for us to spend the night in the car park up there. All this was done with very limited Macedonian and miming skills. Once she’d established that we didn’t plan to sleep in the church itself, she was happy for us to spend the night there. We promised to return the key as soon as we’d finished looking inside the church. So back up through the village, more bemused smiles and waves. The church was relatively simple inside compared to some, and was apparently originally thought to have been built in the 18th century, but then the frescoes were dated to 1191. They are tremendously decorative, one of the country’s treasures and featured on the 50 Denar note. We felt honoured to be trusted with the key. 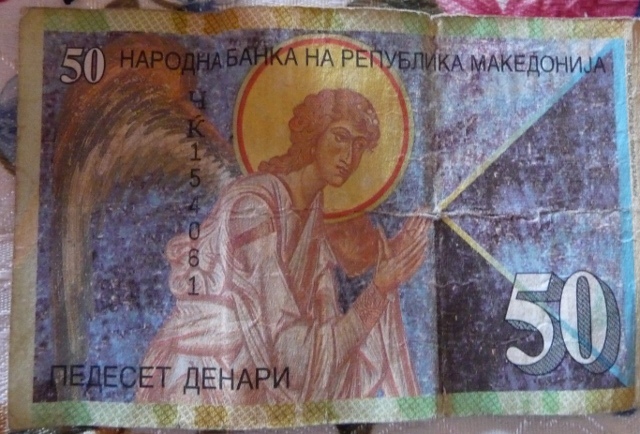 In Macedonia, the tradition is to leave money by the icons, and it looked like it hadn’t been collected in a while. 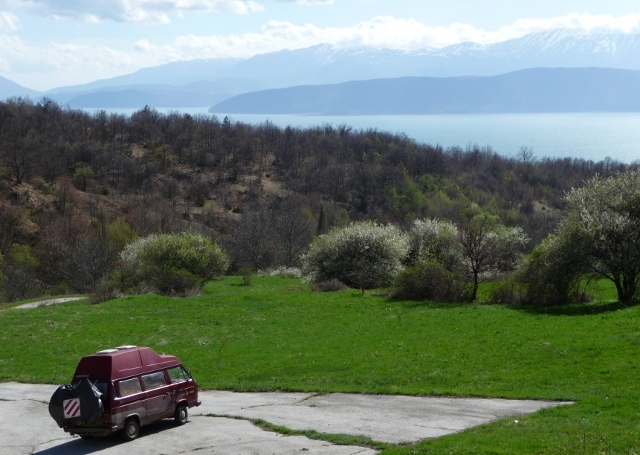 After returning the key, and with goodnight wishes from the lady in the village, we turned down an invitation to drink coffee in Albania with our apple chaps and went to make ourselves at home in our exquisite camping place. We couldn’t believe our luck on finding such a perfect wild camp location, one of the best of the trip so far, and to have the local seal of approval felt appropriate too. All you could hear were the natural sounds, the rushing brook, birdsong and the breeze. The sight of the sun’s last rays casting a rosy glow over the mountains, and two eagles soaring and swooping along the valley. I even got around to doing some sketching. It was also a chilly night of a billion stars – we were a long way from the nearest town – and quite high above sea level. It is these special places that make our hearts sing and encapsulate the best moments of this trip … such a far cry from being squished into a delayed tube train and dealing with the other stresses of modern city life. On our waking, we enjoyed that magical early morning light, the fresh air and birdsong, that heralds a beautiful new day. It was sad to leave such a perfect place, but there was more to see! In the village, we assured our key lady that we’d had a very good night and she waved us on our way. Further down the lake were several more villages, all apple centres, with more Albanians loading up. 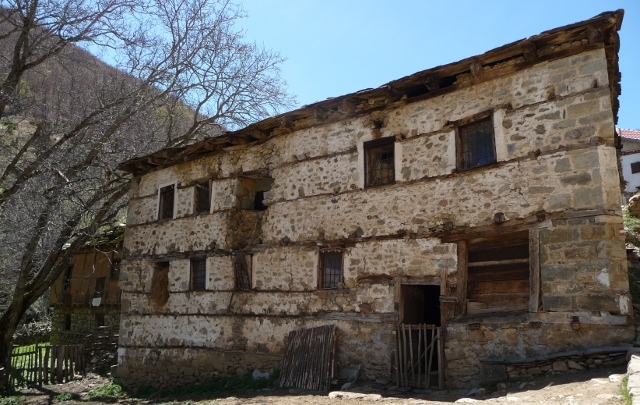 We saw one of our chaps again, evidently he’d been back to Korça overnight and had returned to Macedonia first thing. He looked a little the worse for wear either way. The villages of Brajčino and Ljubojno were also picturesque with pretty houses scattered up wooded valleys, some of them quite large and there was quite a bit of new building going on too. Perhaps they’d recovered their fortunes in spite of the Greek border being closed. After exploring their narrow by-ways, we were on our way to the other side of Mount Pellister, to an old Vlach village. The Vlachs are an ethnic group that exists in pockets around the Balkans, speaking a language more akin to Romanian. The village of Malovište is within the Pellister National Park, and once we’d found the right turning for it we wound steadily up a steep valley. We already felt like we’d stepped back in time coming to this region, but Malovište seemed yet further back. 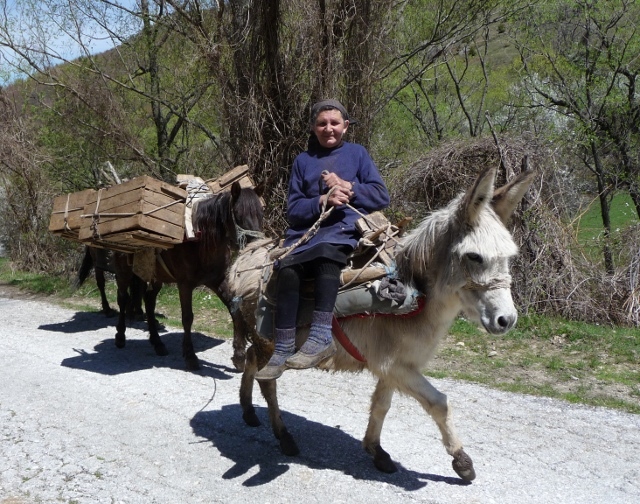 As we approached the village, this lady with her donkey and ponies very kindly allowed me to take her photo. The village was rugged, its main drag was cobbled – huge stones grown rough and uneven over time. Someone had draped a powerlead low over the road at the start of it, so we parked before entering the village proper. This was a good thing! Again there was a gushing stream right through the centre, this time wide enough for small bridges to criss-cross it, and the mixed collection of stone cottages and larger houses followed its course. 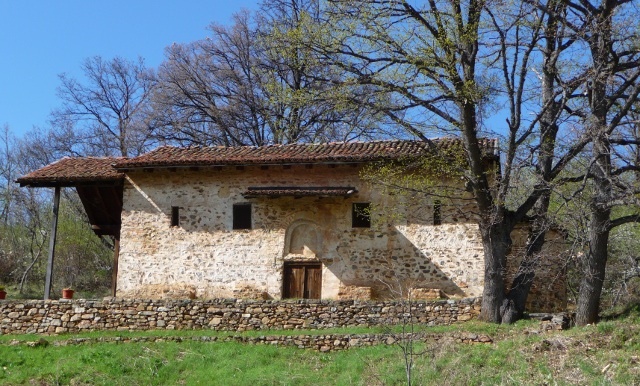 At one time, Malovište was an affluent settlement, its fortunes stemming from its livestock. Its large main church Sveti Petka was 19th century and beautifully decorated. Once again we played hunt the key with the help of some old ladies. The church contains masses of icons, but unfortunately it was quite dark inside so we couldn’t see them very well. We started to walk out of the village towards Sveti Ana, a monastery high in the forests at the top of the valley. The scenery was magnificent as we jumped back and forth over the stream. We turned back before finding Sveti Ana though – it wasn’t clear which way the paths were going and we’d been going at least an hour longer than the half hour the guidebook had mentioned … that’s our excuse anyway. 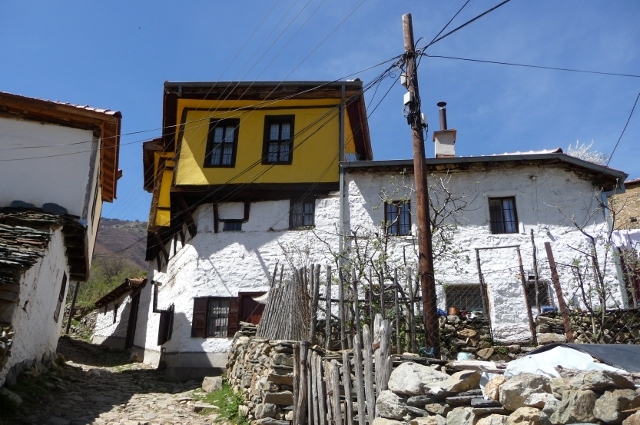 So an amble back to the village and into the van to find Bitola and somewhere to stay. This entry was posted in Art & Culture stuff, By Country - Macedonia, Personal stuff, Travel stuff. Bookmark the permalink.